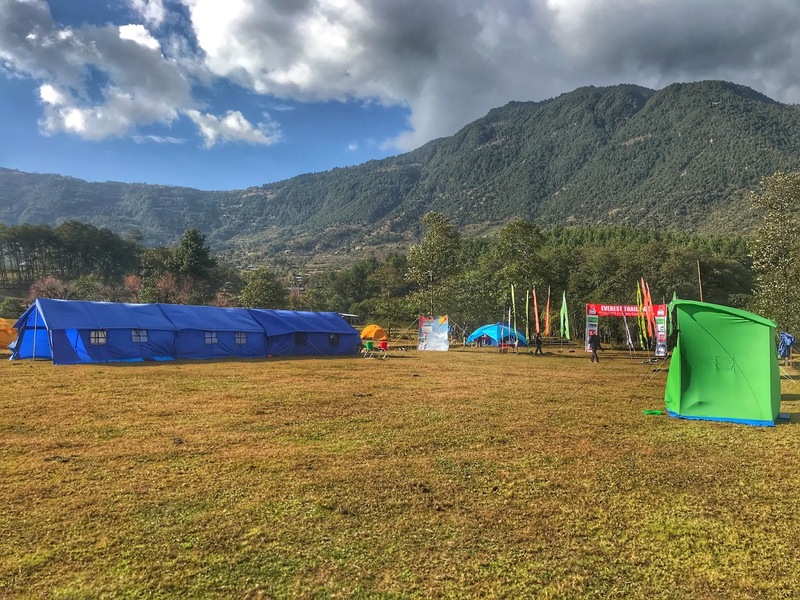 First basecamp setup in Jiri, the Everest Trail race start location. 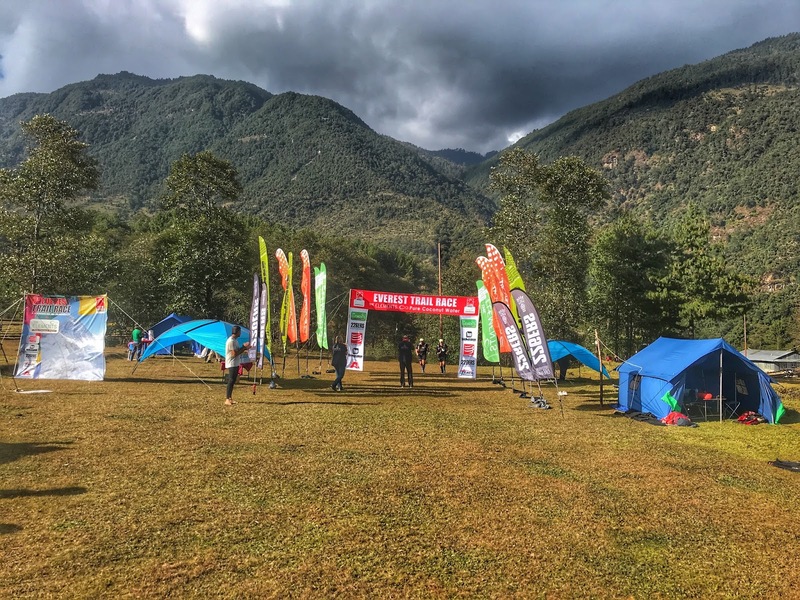 The Everest Trail Race covers 100 miles over 6 days. 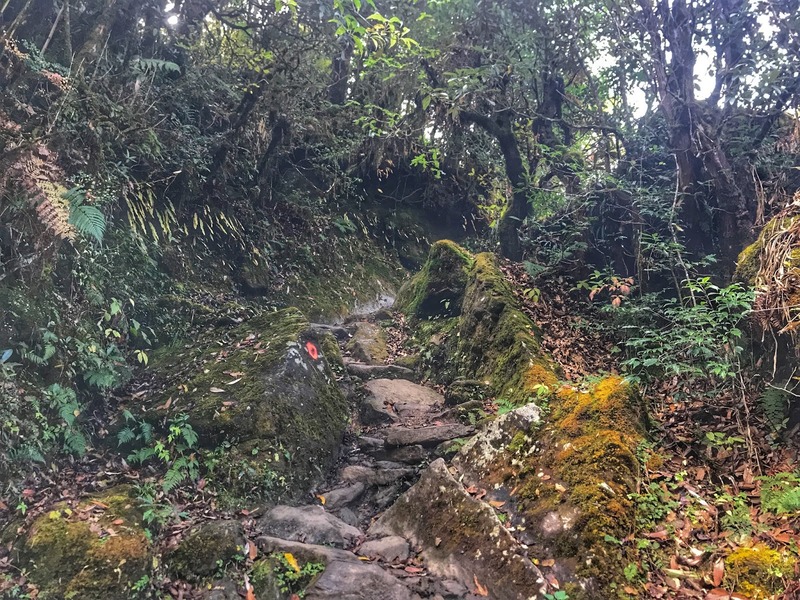 In the process, runners climb approximately 45,000ft, the equivalent of climbing Mount Everest 1.5 times with a maximum altitude of just over 12,000ft that is reached multiple times during the race. The highest point along the course is Pikey Peak summit, which is reached during the second stage of the race. 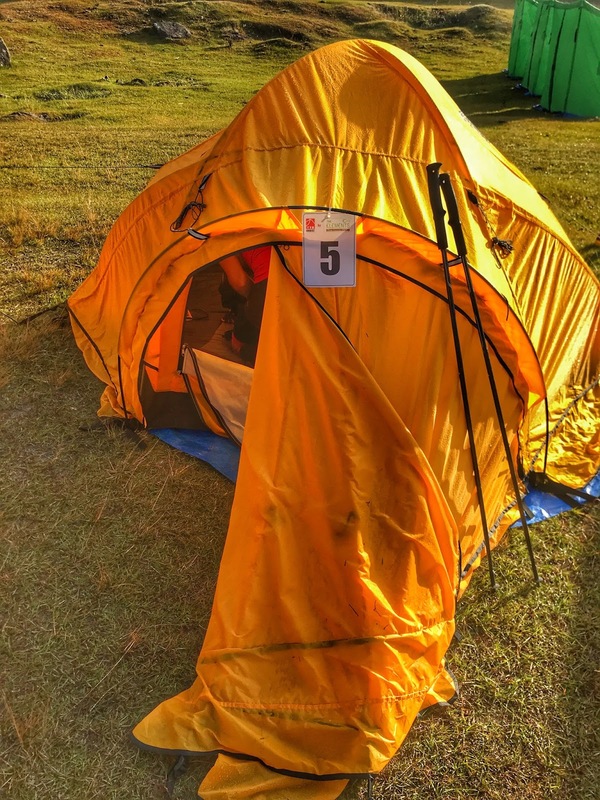 Runners are semi self-sufficient having to carry all gear required over the course of 8 days (including one day prior and one day after the race) including sleeping bags. However, food and drink is provided to all runners during the entire duration of the race. 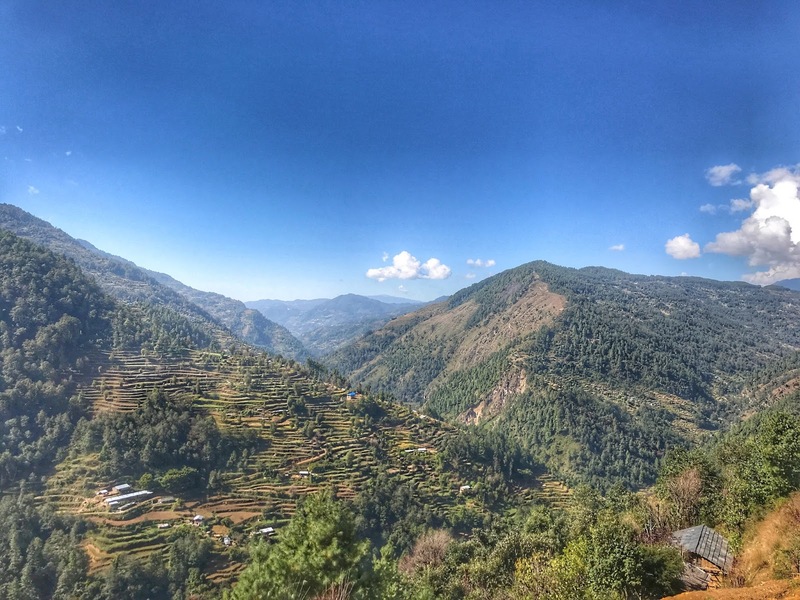 The view from the Jiri valley was spectacular. 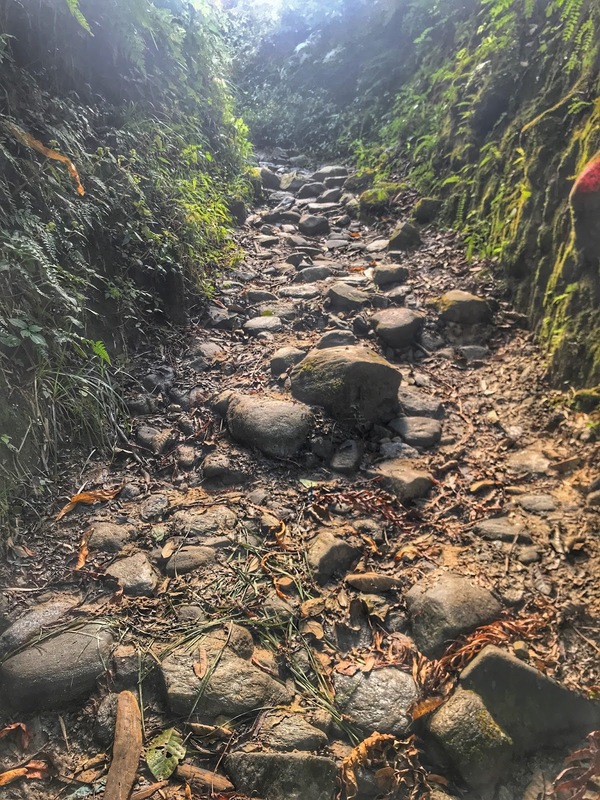 After spending a couple of days in Kathmandu to acclimate, attend mandatory race briefings and gear check and an participate in an organized sightseeing trip to visit the famous Monkey temple among other sites, we started the arduous 9 hour drive to Jiri, the location for the start of the 2017 Everest Trail Race. 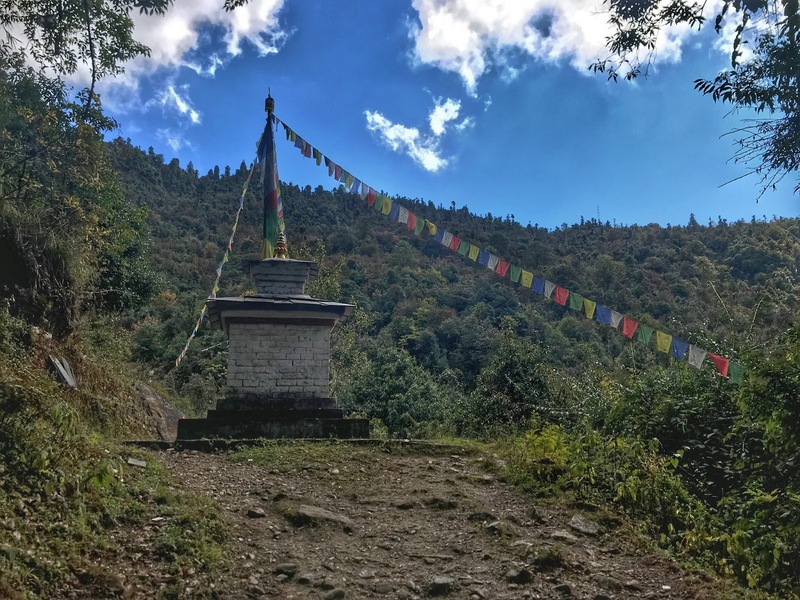 Jiri can only be reached via rather rugged single lane roads, sometimes paved but often just dirt, across and around a number of mountain ranges. Many runners had struggled with severe motion sickness in the past, so I came prepared having taken 2 motion sickness pills the morning of the trip. All 50+ runners were assigned to one of 4 vans. We all received a lunch bag before taking of in the ETR caravan to Jiri. My home for 8 days, shared with Phil Richet from France. The ride was rather adventurous and truly felt like "stage 1" of the race. 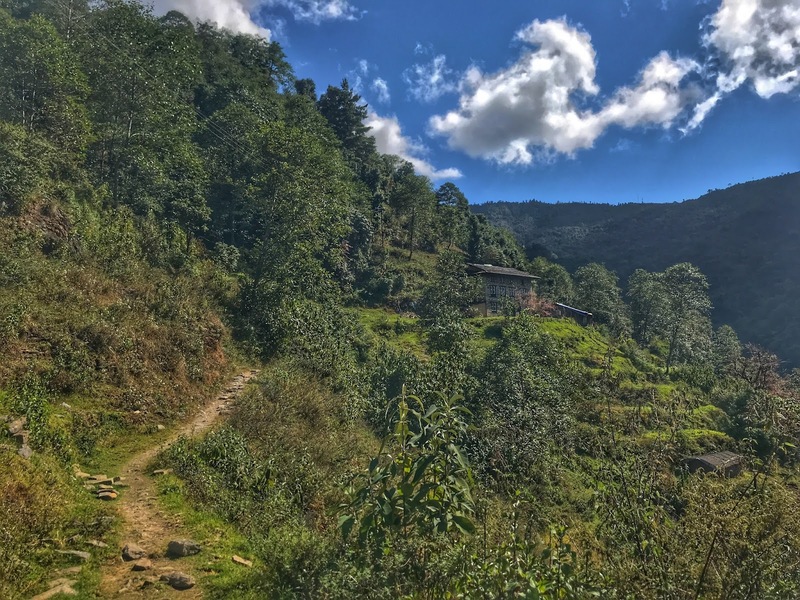 While the narrow winding mountain roads were expertly navigated by our drivers, there were plenty of moments of excitement, one involving one of our vans in a minor accident with a dump truck. In order to navigate the narrow roads safely, drivers would honk their horns at every blind turn in order to evoke a similar response from oncoming traffic, allowing them to anticipate each other and figure out how to pass. This was by far the bumpiest and most exciting ride I've ever been on and I'm still not sure how some of the runners managed to actually sleep. I certainly did not. Some of the amazing friends I've made during the race. 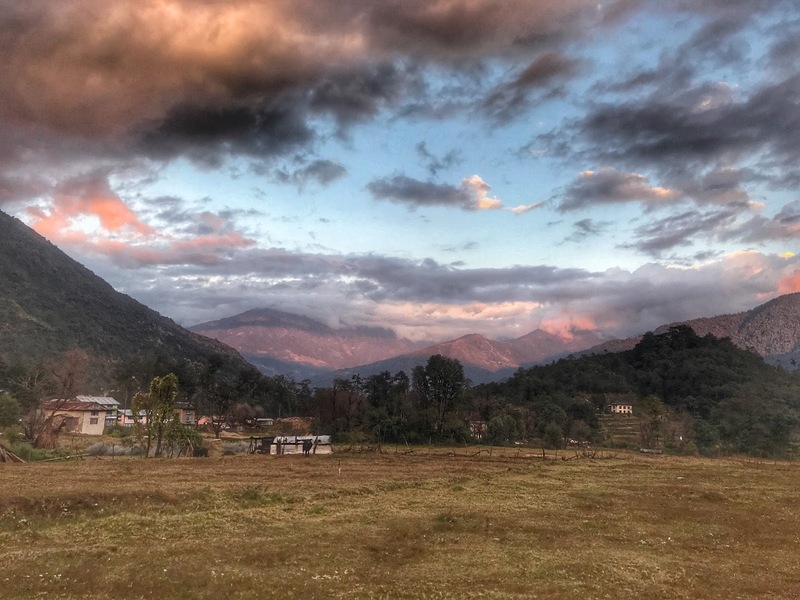 We arrived in Jiri roughly 9 hours later, followed by a short 5 minute hike into our first basecamp. After a few quick photos, we all were assigned to our tents for the week. 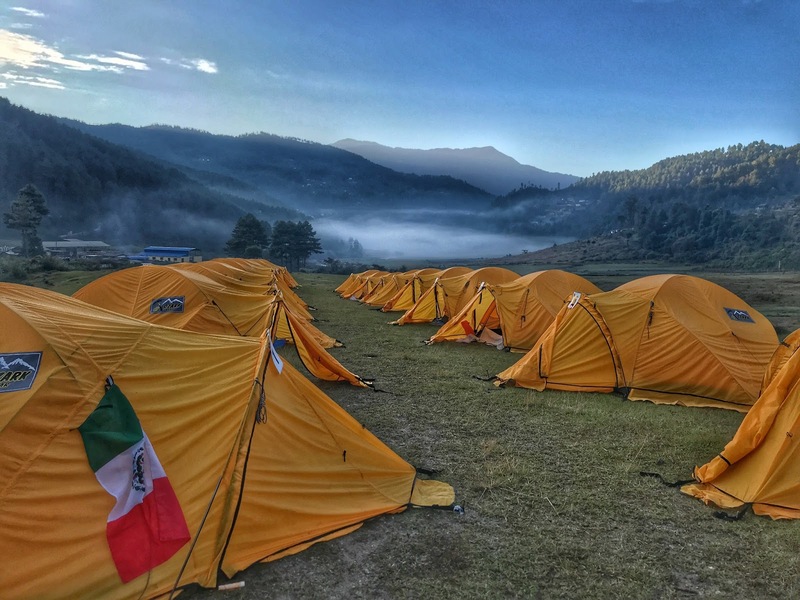 We would actually sleep in two or three different tents as the support crew of 160+ sherpa, porters, cooks and guides would actually set up multiple camp sites in parallel in order to be able to keep up with our daily progress along the course. Since everything had to be largely moved by people carrying gear along the trail, the support team had to set up the next camp site before we'd even leave the previous camp site. This was quite the operation and we were all a bit in awe when we realized the sheer amount of manpower required to support our race. Part of our race routine, picking up our water and fuel for the first part of the stage. My tent mate Philippe and I quickly settled in our tent and got ready for our first meal and pre-race briefing in the blue dinner tent. All of us runners were itching to get the first stage underway. It would allow all of us to settle our nerves and get a feeling for what to expect over the next 6 days. Thankfully, stage 1 was actually the shortest stage of the race, kind of the intro stage to the ETR. AC/DC inspired an air guitar solo by my roomie Philippe prior to the start of stage 1. Every morning would start the same way. 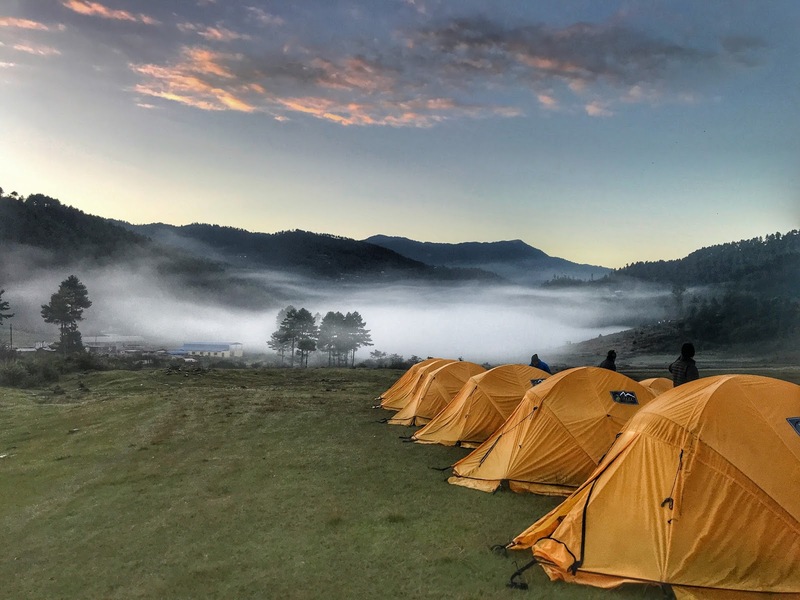 Sherpas would wake us up at a predetermined time, serving us hot tea at the tents. 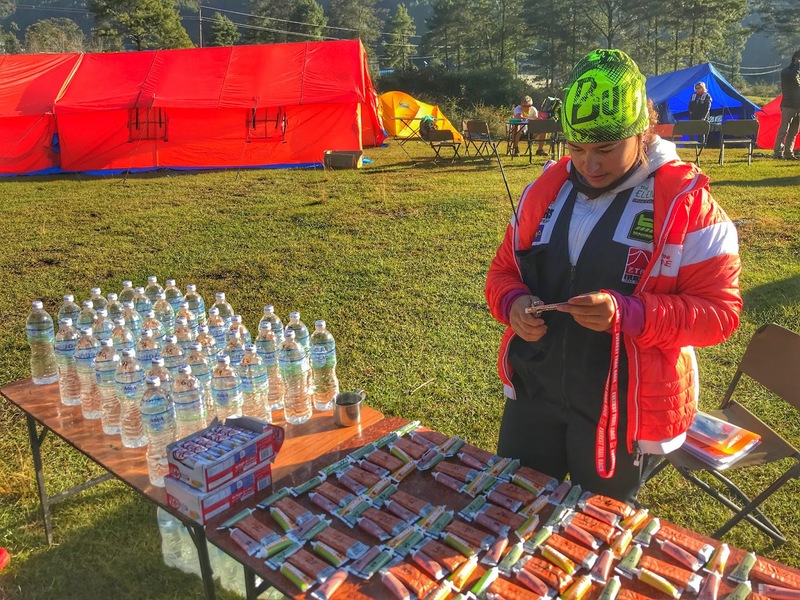 This would be followed by breakfast (mostly carbs of different kinds) in the dinner tent and pick up of our first batch of water and fuel supplies, usually one liter of water and a couple of gels and bars. The support team really was top notch. The meals and food was fantastic. I kept wondering how these guys managed to whip up these meals in the middle of nowhere. The finish line for stage 1 in Bhandar. All runners were required to carry a punch card on a lanyard that would be punched at every checkpoint along the course as well as every morning and evening when we would get additional water and fuel. Every stage generally had anywhere between 2 and 3 checkpoints along the course and missing one of these would usually get you lost as well as penalized by race officials. While I did avoind any missed checkpoints and penalties, I did manage to get lost both on stage 1 and stage 2. After that, I made sure I'd pay very very close attention at any potential intersection as I had no desire to lose any more time. The blue tent, dining tent for 50 runners, the green tent for washing up. About 30 minutes before the race start, the speakers were blasting AC/DC, getting all of us pumped for the adventure ahead. The start of stage 1 was officiated by the local mayor, who wished all of us luck before sending us off towards Bhandar, the location of the finish line at the end of stage 1 and our next basecamp. Valley near the small town of Bhandar, location of the stage 1 finish line and basecamp. 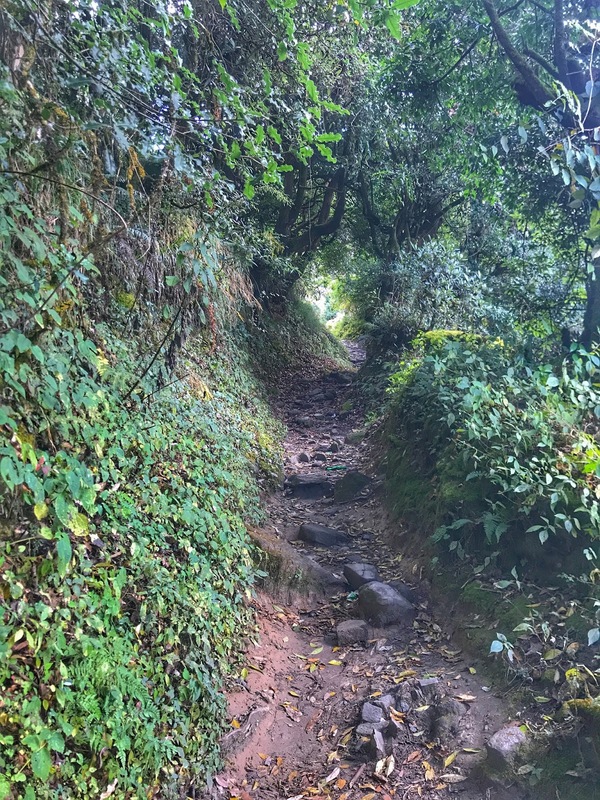 We would cover a total distance of about 21.5 km or 13.3 miles while ascending 1,975m or 6,500ft and descending 1,820m or 6,000ft. It would be a perfect prelude of things to come. Unlike many of the other racers, who had previously completed the Marathon des Sables, Jungle Marathon and various other stage races, my only multi-stage experience came in 2011, when I completed the Desert RATS 148 Mile Stage Race in Colorado/Utah. However, I drew my confidence from my previous ultra marathoning experience and more specifically, the training I had done over the past 9 months leading up this this particular event. 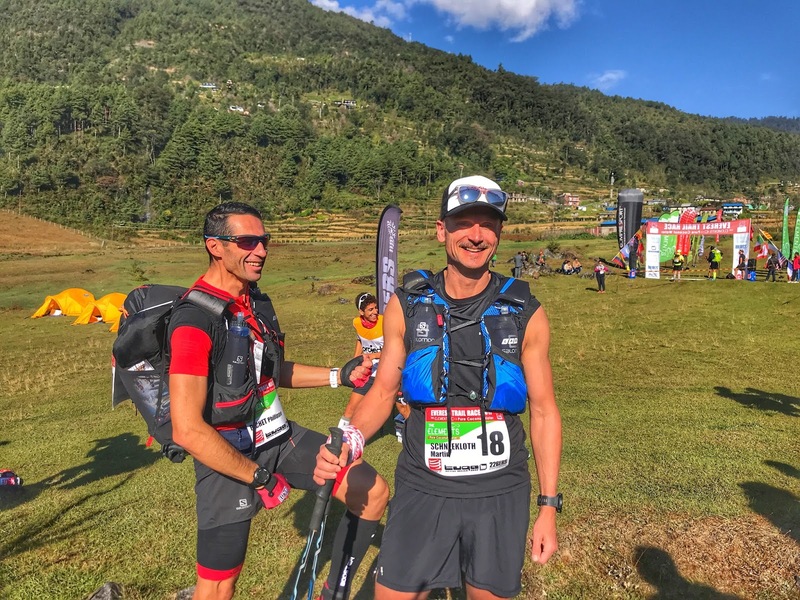 There had been plenty of vert, distance and race experience collected over the course of 2017 and while this race was all about the experience of Nepal and its people, it was a race after all and I had a couple of goals for this one. All roads end in Jiri, now it's 99.9% single track to the finish. Looking at the results from the last year, I figured an A goal of completing all stages within 30 hours would be an aggressive but achievable goal. Secondly, I was hoping that such a performance would possibly get me into the top ten overall and top three in the Master's division. Obviously, this "plan" did not take into consideration the ambitions and abilities of my fellow racers, it just gave me something to strive for. As we were sent off into stage 1, runners took off at a strong pace. I tried to settle into a comfortable pace, really not paying attention to anyone else. I never checked my watch, I just ran by feel. I would continue this approach throughout the race, only ever checking my overall time upon reaching the final checkpoint of each stage to see whether I was close to my A goal. One of the many inspiring monuments along the course. From the start of stage 1 and throughout the race, I would always take the time to "stop and smell the roses". I would take pictures, lots of them. This was likely a once in a lifetime opportunity and I was going to make sure I'd have memories. The scenery was absolutely spectacular. Stopping to take pictures also allowed my heart rate to settle down for a moment. Almost every stage contained a lot of climbing, often at altitude, so serious spikes in one's heart rate were very common. I reached each checkpoint without any problems, following the red circle race course markers all day. When I reached checkpoint 3, the final checkpoint for the stage, I finally checked my watch. I was well on target to run my goal time of 3 hours 30 minutes and I was running just outside the top ten. All that was left was a short 5 km downhill to the finish. I was excited. I filled up my bottles and took off. Apparently, the idea of breaking into the top ten on the final downhill made me lose my focus just long enough that I missed a turn on the trail. Views across the mountains, highlighting the farming along many mountain slopes. It took me nearly a mile to realize my mistake and by then, I was completely lost. Luckily, I had stored the previous year's course on my watch, but I hadn't loaded it. I had to stop my watch, close the activity, load the course and start a new activity. Oh, the pleasures of modern technology:-) By the time I found my way back onto the course, a few runners had passed my and I had lost close to 20 minutes. However, I still only missed my goal time by 4 minutes, so I was pretty pleased when I finally crossed the finish line in 3 hours 34 minutes and 14th place overall. 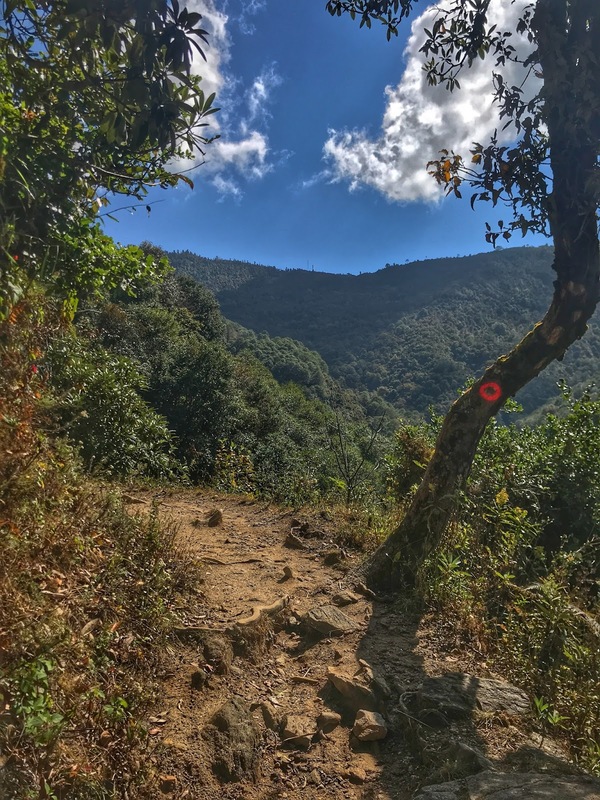 The typical trail marking for the Everest Trail Race, red circles. As soon as I crossed the finish line I was handed my 2 liters of water for the evening. Next, it was time to get out of the running close and into the compression tights and dry camp clothes to start the recovery for the next stage. 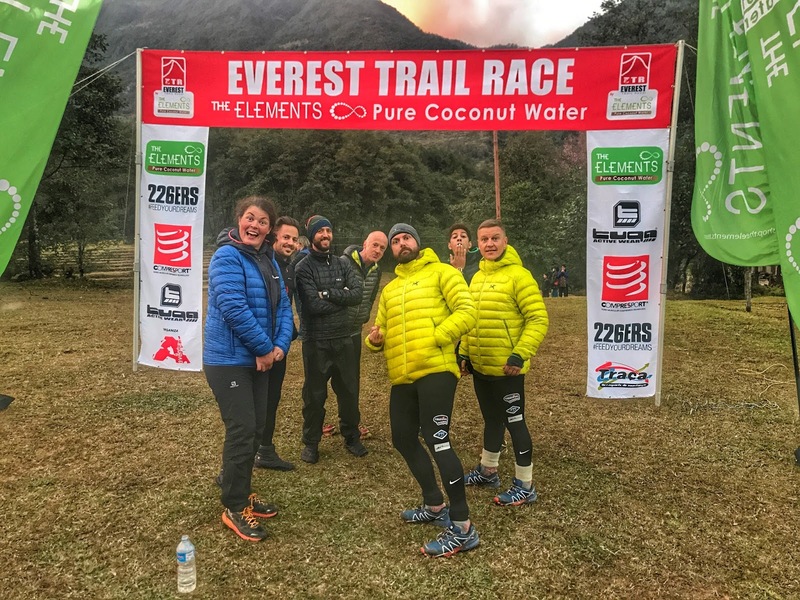 The support crew had served up hot tea and coffee and cookies in the dinner tent along with some rice and pasta for a late lunch. They would do this at the end of every stage, allowing runners to refuel and aid in their recovery for the next day. Gnarly technical trails made up the majority of the course.